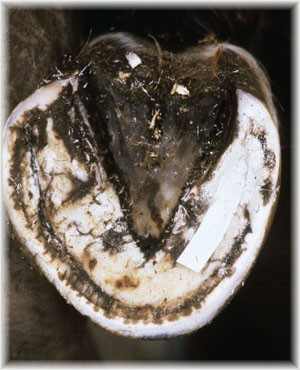 In narrow hooves, all hoof capsule distortion is focused in the toe area, so in mild cases, distension of the laminae (stretching) is seen only in the toe and the distended laminae are aligned parallel to each other. 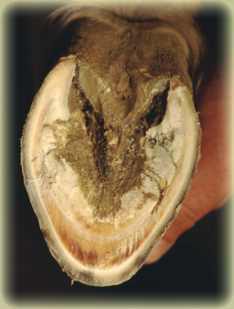 In more sever cases, this type of hoof shape predisposes the distal phalanx to rotation, as its the laminae at the toe which are mostly destroyed. 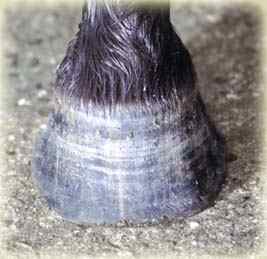 In round hoof shapes there is no focus for hoof distortion so the hoof capsule 'bells out' and a greater area of laminae is damaged. 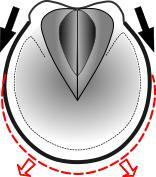 The distended laminae are orientated radially, with the distended laminae extending towards the quarters. With a greater proportion of laminae being destroyed. 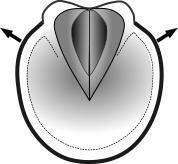 In the more severe cases, sinking of the distal phalanx is more likely to happen. 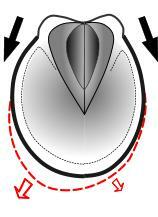 Asymmetric hoof shapes help to confirm the hypothesis that hoof shape determines laminar damage. 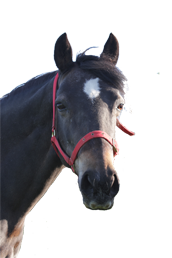 An asymmetric hoof shape has one side which is round and one side which is narrow, this causes the laminar distension to be biased towards the rounder side. 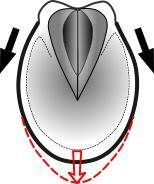 This hoof shape predisposes the distal phalanx to sink on the rounder side of the hoof. 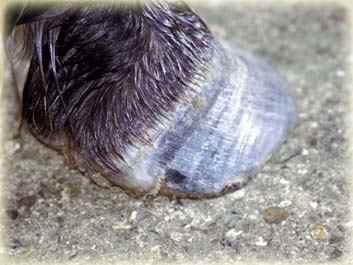 This pony is not lame at the present time, but shows signs of divergent growth rings at the heels, this would usually cause laminitis in other hoof shapes but the dorsal surface of the hoof is not being distorted. This is because the heels are splaying outwards, instead of forward towards the dorsal wall and the rapid heel growth is being 'dissipated' harmlessly as the heel splay. Over time, if the heels continue to grow rapidly, the hoof shape will gradually change to a more boxy shape. 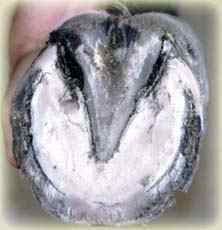 This modifies the hoof shape into a narrow shape allowing the hoof distortion to now focus in the toe, the laminae will then become traumatised and the pony will become laminitic. This accounts for why some animals can take longer to become laminitic than others. 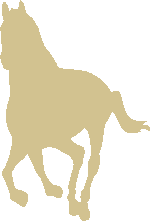 It can also be a warning sign that the animal is on the verge of developing laminitis.